Tarrare can eat anything: not just food, and not just flesh, but books, corks, bones, solid metal… And lord, how he hungers. This Toronto Fringe Festival story explores the life and times of a real historical figure, probing his journey from urchin to showman to soldier to spy, and how his lust to consume would prove his undoing. The cast do fine work: John Fray’s Tarrare is adaptable and relatable, even if he occasionally strays dangerously close to Puck; Cydney Penner’s Delphine swoons and schemes wonderfully, and she also gets a marvellous turn as a general who puts the ‘fat’ in ‘fatuous’; Scott Clarkson plays the show’s authority figures with a firm hand and a subtle touch (the sneaky business he does as Alfonso is a particular treat); and Kristoffer Pedlar does the best he can with the tiny role of the angsty sword-swallower. And that’s a problem. The sword-swallower could have disappeared from the script entirely and nothing would have been lost: his sole purpose appears to be his horrible death — and his death scene is so cheesy that it, too, didn’t feel like it really belonged. This script would have benefited from a brutal dramaturg, and could probably be cut by 15 minutes of its current 55 without losing anything vital. I also think this show would benefit from less time spent on character exposition and more on moving the story along. We already know how a tart with a heart or a snake-oil salesman look, sound and smell: several characters in this piece are mainstream archetypes without anything particularly novel or remarkable to set them apart, and every minute spent “re-introducing” us felt like a minute wasted. You’ve only got an hour; make the most of it. Designer Cat Haywood’s costumes are a gift to the production, especially the military regalia — although the shoe buckles alone are a neat touch. The interaction between Penner and Fray is worth the price of admission, and I’m starting to look forward to Clarkson more and more every time I see one of his pieces. If the team behind Tarrare can iron out the structural problems, they’ve got something very interesting here. More historical context, more investigation into Tarrare and his psyche, less time re-introducing us to characters we already know, and lose that cheesy shadowplay screen: you’re better than that. 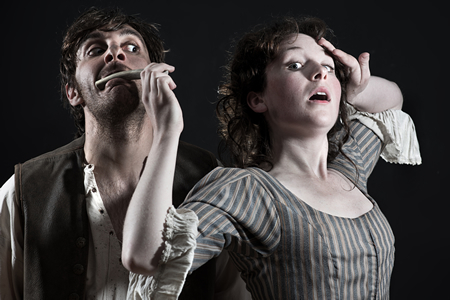 Photograph of John Fray as Tarrare and Cydney Penner as Delphine by Dahlia Katz.